Mix all the ingredients in a large bowl and gradually add cold water. The first pouring of water makes the paste thick and lumpy. Keep whisking and adding water and the mixture will get thinner and smoother. The quantity of water depends on the consistency you like, ideally the finished dip should have consistence of good cream. Green Tahini Dip Add 1/2 cup parsley, 1/4 cup coriander and 14 cup mint, all chopped, to the basic tahini dip recipe. 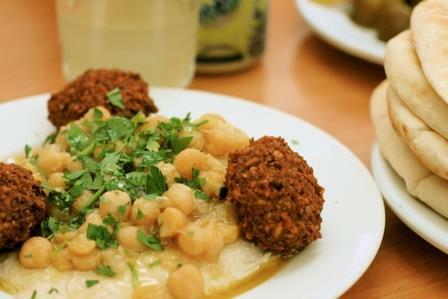 Put the warm chickpeas, a little of the cooking liquid and prepared hummus in a big bowl. Add lemon juice, garlic, cumin and salt. Add tahini gradually and mix well. Spoon the Masabacha hummus, still warm onto a slightly deep plate. Make a well in the middle and add some more cooked chick peas. Sprinkle olive, lemon and chopped parsley over it. Heat the oil in a large, heavy frying pan and sauté the onions until they turn golden. Add the meat and stir-fry for 2-3 minutes, breaking it down into small crumbs with a fork. Add garlic, season with salt, pepper and baharat and fry 1-2 minutes. Add half the parsley, mix well and remove and keep warm. Spoon the hummus onto several plates and flatten it to create a crater in the center of each plate. 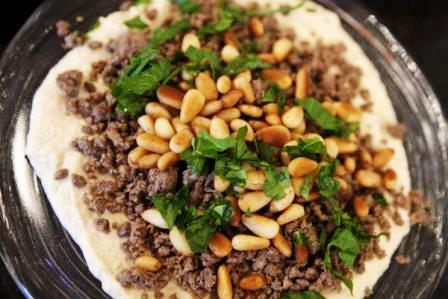 Heap the meat mixture in the crater, sprinkle with the remaining parsley and top with pine nuts. Drizzle some olive oil and serve at once.